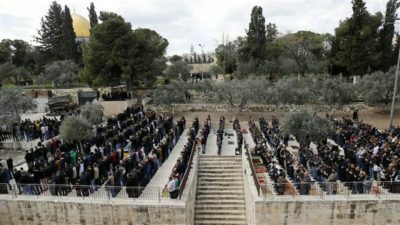 In the latest escalation against the Al Aqsa Mosque in Jerusalem, the third holiest site in Islam, an Israeli court ruled Sunday that the Gate of Mercy (Bab al-Rahma) prayer area in the Al Aqsa Mosque compound would be closed for at least sixty days. This comes after two weeks of disruption of Friday prayers at the mosque by Israeli troops, who forced worshipers out of the mosque and onto the street, where they conducted the weekly prayer service on the street in front of the closed gate. The Israeli government has, for years, been digging underneath the Al Aqsa Mosque in supposed ‘archaeological digs’ which Muslim leaders say are, in fact, measures taken to destabilize the mosque compound and cause it to collapse. The Islamic Endowment (Waqf) which administers the Al Aqsa Mosque now has sixty days to appeal the court’s decision. In the meantime, thousands of Palestinian and international Muslims coming to pray at the mosque will likely be forced out by Israeli soldiers. The obstruction of the freedom to worship is a direct violation of international law, but despite the illegality of these actions, Israeli authorities have frequently prevented Muslims from engaging in their right to worship at the Al Aqsa Mosque. Following the court ruling on Sunday, the Palestinian Foreign Ministry issued a statement condemning the decision, stating that Israeli courts have no jurisdiction over the Al Aqsa Mosque. A similar statement was issued by the Jordanian Foreign Ministry, which stated that the Al Aqsa Mosque is on Occupied Territory, and as such, Israeli civil courts have no jurisdiction to make decisions about the mosque property. In their statement, the Palestinian Foreign Ministry stated that this court decision is part of a plan by right-wing Israeli extremists groups to take over the entire mosque compound to demolish it and make way for a Jewish temple in its place. Israeli forces took over Jerusalem in 1967, and have, since then, moved hundreds of thousands of Israelis into the area, displacing many indigenous Palestinians with deep ancestral ties to the city. Israeli authorities have placed numerous restrictions on Palestinian Jerusalemites, since their claim to the city is tenuous and based only on a military takeover. Taking land by military force without a negotiated settlement of all parties involved is a direct violation of the Fourth Geneva Convention, to which Israel is a signatory.